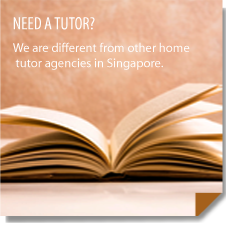 Why Edwin Tuition Agency is different from other home tutor agencies in Singapore. We listen to your child’s specific needs before introducing home tutors to you. After understanding your needs, we direct the home tutors to focus on the appropriate ways to teach, motivate, encourage and support your child in their learning process. Our enthusiastic and patient home tutors offer an enjoyable and dynamic way of learning. We assess and respect your child as an unique individual who needs to have tailored home tuition that works for him/her. Please provide us with the details of your specific needs or requests for home tutoring. After receiving your information, we will comb through our database of home tutors in Singapore and find the tutor best suited to match your needs, and contact you as soon as possible so your child can start growing motivation and confidence with one of our home tutors. Remember, the more specific and detailed your needs are, the better we are able to match your student’s needs! Do provide as much detail as possible so we can provide the best home tutors for your child!